Latrobe has pulled its starters in the fourth quarter of big games before. But that was when it had commanding leads that made for anticlimactic finishes. When backups began to trickle in Friday night at Fox Chapel in a game most expected to be action-packed and close, the Wildcats were down by 30 against the homestanding Foxes. Even though the starters checked back in later, the damage was done. A bad-to-worse night tormented the Wildcats, while the Foxes bounced back from a tough defeat in a big away, coasting to a brow-raising, 72-45 win in Section 3-6A. It was Latrobe’s worst loss since falling 72-47 at Uniontown in 2013. The Wildcats (9-4, 4-2) came in averaging 74.1 points. 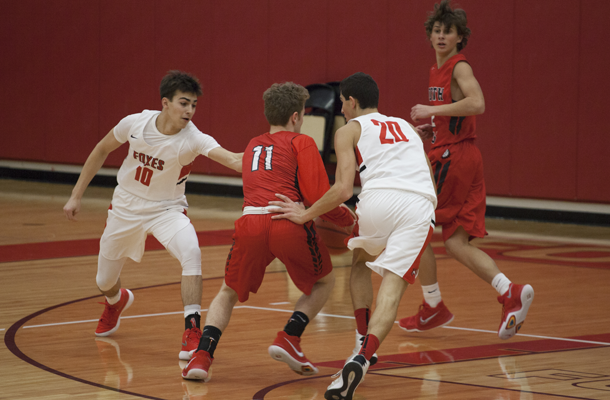 Fox Chapel (9-4, 3-3) was coming off a 54-53 loss to Penn-Trafford in which senior guard Carson Cohen did not play because he was going through concussion protocol. Cohen returned against Latrobe and looked like the best player on the floor. He scored 19 points and delivered seven assists, while 6-foot-3 senior forward Dom McGriff led all scorers with 22 points and pulled down 10 rebounds for Fox Chapel. Last year, the teams split in a pair of high-scoring contests with both winning on the road. Fox Chapel won 84-82, and Latrobe downed the Foxes, 81-70. Their first meeting of 2017-18 was close early, and Reed Fenton’s jumper got the Wildcats within 21-15 in the second quarter. But McGriff scored inside off a feed from Micah Morris to push the lead to double figures, and the Foxes dropped the anvil down from there, sharing the ball with backdoor cuts and limiting Latrobe’s fast-break game. Those would be Fenton and Bryce Butler, the junior scoring tandem that averages a combined 42 points. They were held to 17 this time, with Butler netting nine and Fenton eight. Skrinjar was thrilled with his team’s defense, especially how it performed against Fenton. Fox Chapel came in allowing a section-low 50.8 points a game. Fox Chapel powered its way to a commanding, 42-24 halftime lead. An array of backdoor cuts led to easy baskets. The Foxes finished with 25 assists. Cohen scored eight in the Foxes’ 26-point second quarter, including a pair of 3-pointers. Cohen made a perfect, backdoor alley-oop pass to McGriff, who made the layup to give the Foxes a 38-20 advantage. McGriff posted his sixth double-double of the season. Back-to-back 3’s by Arnold Vento and Noah Marks pushed the lead to 53-31 in the third. Marks finished with 11 points. The Foxes led by 28 after three quarters. Reserves played much of the fourth for both teams. Latrobe was called for three charges in the first quarter as it fell behind, 16-9. McGriff had a thundering dunk early.